Guest books are a thing of the past; keep the message short and sweet with our personalised Bang on the Door Wedding day plate! Personalise this Bang On The Door Wedding Message Plate with the brides name up to 12 characters and the grooms name up to 12 characters. You can also have a date using up to 20 characters. 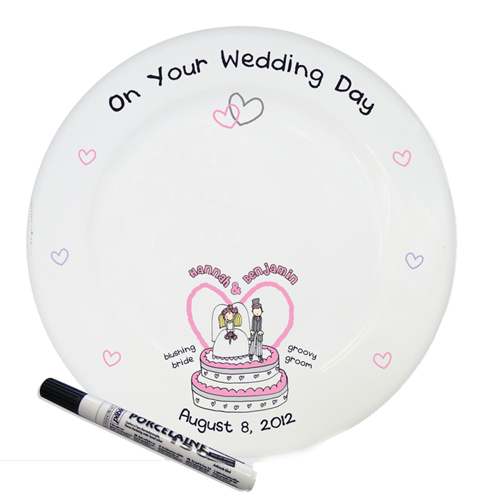 'On Your Wedding Day' 'groovy groom' and 'blushing bride' will be fixed text on this item. Supplied with a special pen for guests to sign. Personalise with the brides name up to 12 characters and the grooms name up to 12 characters. You can also have a date using up to 20 characters.